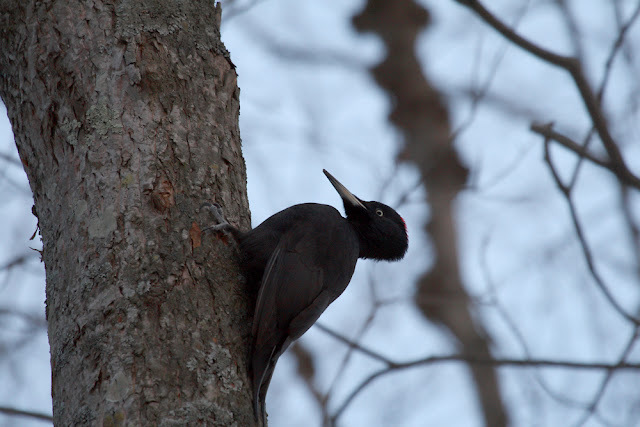 A female Black Woodpecker at Onuma late this afternoon. It was just before sunset so I had to use my lens wide open at ISO 800.........hence the title of today's post. To make it even halfway decent I had to use noise reduction filters in photoshop, something I normally never have to bother with. 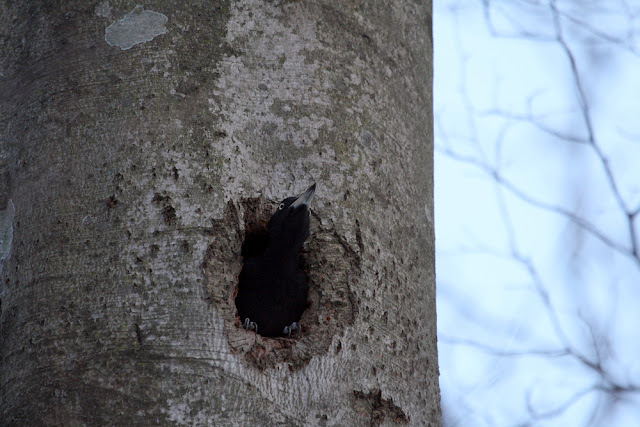 Actually it was noisy in the conventional sense too, retiring to a hole and crying out loud for about 5 minutes. I was pretty close, none of the above 4 photos were cropped. I hope I can get as close to this species again (especially before I have to return the 100-400 lens). I wouldn't go as close during the breeding season of course. 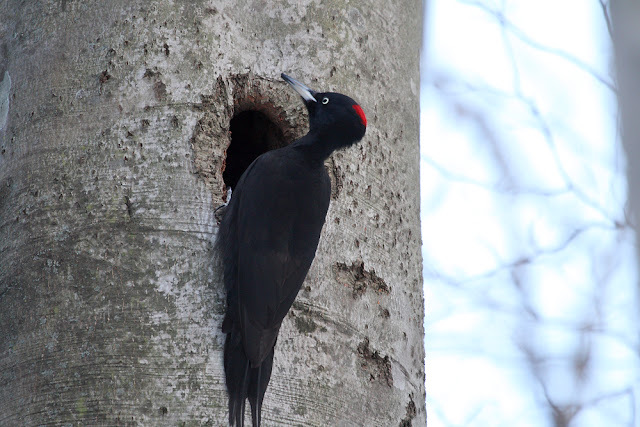 I think this female just uses this hole for roosting, I often see her around this area just before sundown. Earlier in the day we had been up to Yakumo. 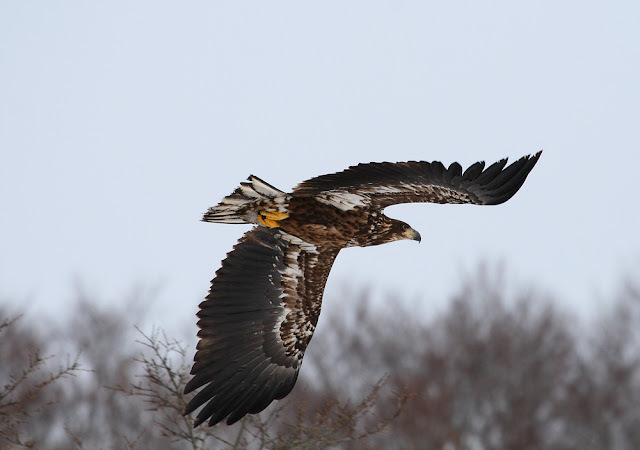 Today was relatively mild but the eagles were nowhere near as co-operative as last week. This adult Stellers and immature White tailed were the best pictures of the morning. The Whitetailed is the only cropped pic of the day (and only slightly at that). 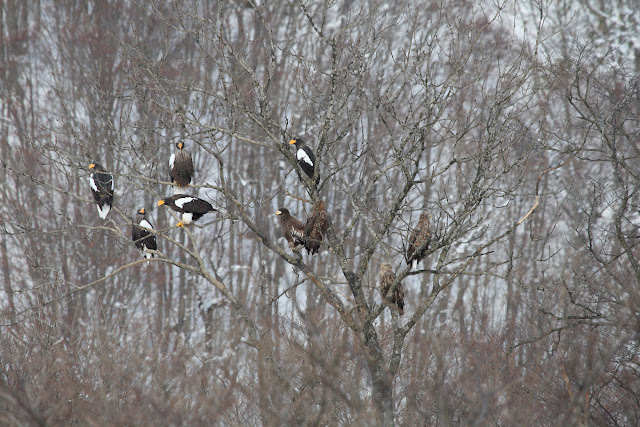 Once again there were lots of Eagles (I estimate 50-70). Most of them just sitting around in the distance like this. Here's yet another view of Mt Komagadake, this one from the west. Another draw for Liverpool, looks like they have a battle on just to finish 4th. After they started the season so well and England had those 2 victories in the qualifiers I had high hopes for the 2007/8 season. Now I'm hoping Liverpool can finish 4th and am trying to forget international football exists until next season. Sad but true. 1983 (Jan 29) Gale force winds blew a Fulmar upstream to Penwortham. 1984 (Jan 21) Ribble at Penwortham again. 72 Whooper/Bewicks Swan, Corn Bunting and Tree Sparrow, Pinkfooted Goose, Dunlin and Snipe. The following weekend (29th) a Green Sandpiper was a surprise find. 1985 (Jan 20) Same place. same birds pretty much. 3 Ruff, 300 Dunlin plus the usual wildfowl. 2001 (mid-late Jan). I was in Venezuela, me and a friend were visting another friend who was working for the BBC. Not a birding trip really. actually not all. My only ever experience of South America to date. 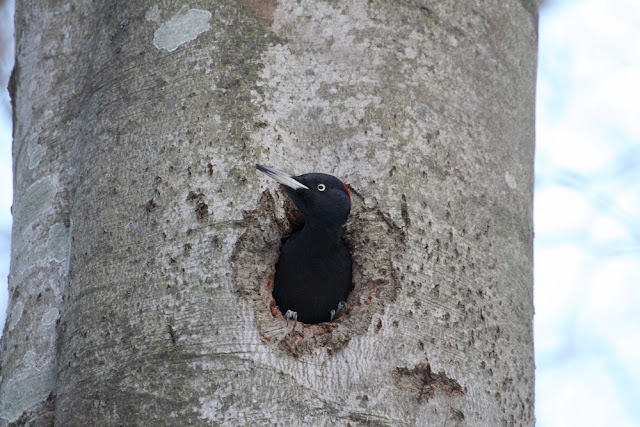 I landed in Caracas and my friend (who had developed an interest in birding) took me to the local park near his flat. Wow. Scarlet Ibis was the most memorable species but there was also Chestnut Fronted Macaw, Red Capped Cardinal, Plumbeous Kite, Yellow Headed and Oriole Blackbird, Saffron Finch, Blue Grey Tanager and the abundant Kiskadee and Black Vulture and oh lots of other stuff. It was a bit overwhelming to be honest, all those totally unfamiliar species. 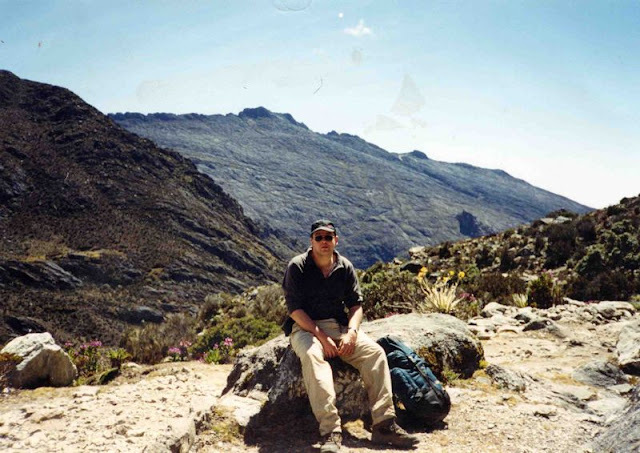 I then met my other friend and we headed off to Merida in the Andes. We got the cable car up to the top (the highest in the world no less) and hiked over a high pass and down to a sphagetti western looking village whose name I can't remember. I did see Bearded Helmetcrest (a rare high altitude hummingbird) and manged to identify a handful of other species........Rufous Spinetail, Great Thrush, Velvet Fronted Grackle, Paramo Seedeater and Plumbeous Sierra Finch. The pass was over 4500 meters and we had ascended rapidly from about 2000 (I think, maybe less) and I was as unfit as ever as well as a heavy smoker. It was a brutal hike especially as were carrying all our luggage (why? I forget). Here's a pic of me from that day taken by my good friend Franny. 2003 (22 Jan) Hakodate. My first Waxwings in Japan a mixed flock of Bohemian and Japanese Waxwing, about 50 in all). They had all gone the next day. 2004. This time the first (unidentified) Waxwings were on Jan 21. On the 26th a flock of 100 Bohemian with a couple of Japanese were near my flat.......they hung around for a few days. 2006. A bitterly cold winter and i entered hospital at the end of the month for a knee op. The Waxwings arrived early this tear on Jan 18 and there were several influxes throughout the winter. the early waves were mainly Japanese and later on Bohemian....right until later March. 2007 Even earlier last year...the 17th. Mainly Japanese Waxwing and again several influxes right through winter and early spring.......on the 25th there was an Ancient Murrelet at Moheji. Hi Carmo, wondered why your blog had been a bit quiet recently. If you do come to Hokkaido and chose to come to Hakodate you'd be welcome to stay in our spare room. We can go out birding in the day and then come back, get drunk and watch Liverpool draw again against Fulham or someone.